The Women’s is on the corner of Grattan St and Flemington Rd in Parkville (Melways Map 2B A7). View a street plan showing the location of the Women's. Wheelchair access is available at the hospital’s main entrance on Grattan Street (Ground Level) and the Women's Emergency Care entrance on Flemington Rd (Lower Ground entrance). 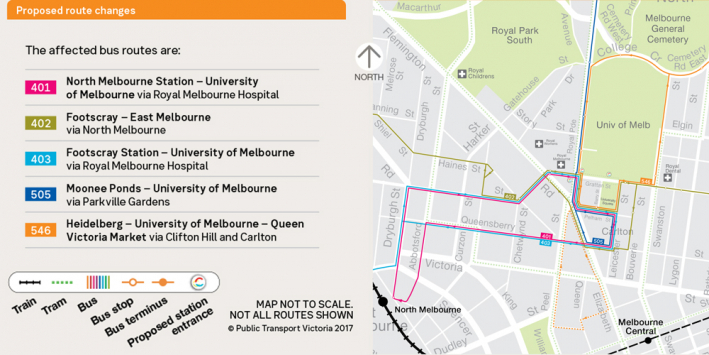 If you plan to travel to the hospital by public transport, please check your travel route on the Public Transport Victoria website and allow any extra time needed. Grattan Street will be closed between Royal Parade and Leicester Street for up to five years. From early to mid 2019, Grattan Street will be closed between Flemington Road and Royal Parade. There may be periods of medium-high level noise associated with these works. A number of car parking spaces will be removed as part of these works to support relocated bus stops. Please see the Victoria Government Metro Tunnel website for more information. Please select the link to route details for information about service disruptions. Tram 19, Stop 10. North Coburg to Elizabeth Street, stops at the corner of Royal Parade and Grattan Street. Route details for Tram 19. Tram 58, Stop 14. West Coburg to Toorack, stops at the corner of Grattan Street and Flemington Road. Route details for Tram 58. Tram 59, Stop 14. Airport West to Elizabeth Street, stops at the corner of Grattan Street and Flemington Road. Route details for Tram 59. Tram 57, Stop 19. West Maribyrnong – City / Flinders Street Station via Maribyrnong > Flemington > Nth Melbourne, stops at the corner of Flemington Rd / Royal Park / Royal Children’s Hospital. Route details for Tram 57. Some Parkville bus services have been re-routed due to the Metro Tunnel works. Bus services no longer run along Grattan Street between Royal Parade and Leicester Street as this section has closed for up to five years while a new underground train station is built. The affected bus routes are 401, 402, 403, 505, 546. To learn more about the changes visit Parkville buses web page at Public Tansport Victoria. Download the Transport for Victoria (TFV) flyer below for information about ways to provide feedback about the changes. Bus 401 - North Melbourne Terminus in Ireland Street to the University of Melbourne via Parkville hospitals. Bus 402 - between Footscray and East Melbourne via Parkville hospitals. Bus 403 - between Footscray Station and University of Melbourne. Stops at Royal Melbourne Hospital. Bus 505 - between Moonee Ponds and Melbourne University via Parkville Gardens. Stops on Royal Parade near Genetics Lane. Bus 546 - between Heidelberg and Melbourne University. Stops at the corner of Royal Parade and Grattan St. Car parking at the underground car park of the Women’s main building is for staff, patients and their visitors only. The underground car parking is accessed from the Flemington Rd car park entrance. There are a number of parking bays set aside for disabled visitors and patients on level B1. There is also a small area for pick-up and drop-off at the Lower Ground entrance. Follow this link for more information about concession parking fees at the Women's Parkville car park. Lifts lead directly to the main reception, outpatient services or private consulting suites. There are secure bicycle racks at the hospital’s main entrance (Grattan Street) and the emergency entrance (Flemington Rd). 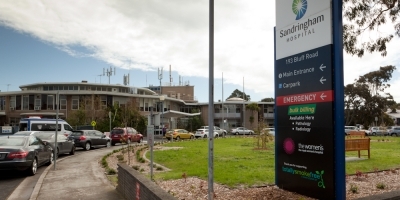 The Women's at Sandringham Hospital is located at 193 Bluff Road, Sandringham, corner of Edward Street (Melway reference 76 K12). View a street plan showing the location. Wheelchair access is available at the hospital’s main entrance. You can get to Sandringham by train and bus. Bus number 600 (Melbourne Bus Link) and bus number 825 (Moorabbin Transit) stop near the hospital. The nearest train station is Sandringham station. From the station, catch the Route 600 bus to the hospital. Contact Public Transport Victoria for more details on public transport options from your area. Taxis can drop you at the hospital. When leaving Sandringham you can order a taxi using the free taxi phone near the Emergency Department entrance or in the Consulting Clinic. Please let the taxi company know if you are at the Consulting Clinic Reception, Main Reception or in the Emergency Department. The main entrance and the Emergency Department entrance are both on Bluff Road and offer free 10 minute only zones for patient drop-off and pick-up. The main 24 hour car park is through the main entrance in Bluff Road. There are some free, 30-minute parking spaces at the front of the hospital. Some areas are restricted. Please read signs carefully as infringement notices may be issued. Reserved parking is available for haemodialysis patients next to the Emergency Department. Fees are displayed at the entrance and you pay as you leave. Designated disability parking is located just inside the entrance to the main car park and in front of the consulting clinic.